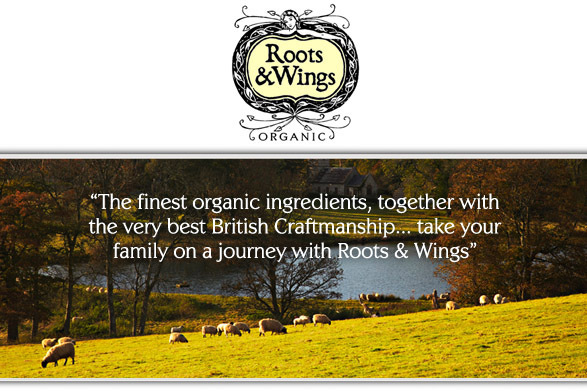 Welcome to Roots & Wings, an organic and natural brand for all of the family. Our products are made from the best ingredients, carefully and ethically sourced and produced by craftsmen to our recipes across the UK so that you can enjoy delicious meals with your friends and family. The name Roots & Wings was inspired by the perceived wisdom: ‘What’s the best thing in life you can give your children: roots for confidence and stability to grow and wings for aspiration’. As food and cooking are so central to good family life one of the key motivations behind Roots & Wings was the love of great food which through the craftsmanship of so many fantastic people in the UK can be made available to everyone. Eating and enjoying food together as a family is so important and providing good food is one way of showing how much a family is cherished, especially when that food has been grown and nurtured and made with care Everyone wants to do the best they can for their family. If you can provide the roots to enjoy home and keep them grounded, you’ll also be giving them confidence and the wings to explore & grow! And it’s these values that are at the very heart of our brand - where our very passionate farmers, growers and chefs have become an integral part of our family too.